The U.S. space program is still active, even if we don't hear about it so often these days. If you’re fascinated by space exploration, its challenges and triumphs, and all the innovations that have come about as a result, you might enjoy attending this special opportunity to view a live rocket launch. Kennedy Space Center Visitor Complex guests can experience the breathtaking sights and sounds of the launch of an Atlas V rocket as it lifts off on Tuesday, September 16, 2014. 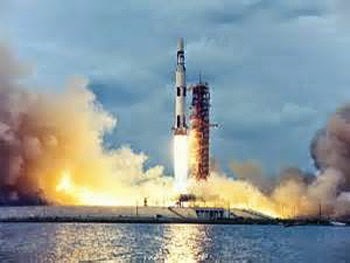 Visitors may enjoy a front row seat to view the launch from the Apollo/Saturn V Center, the closest possible public viewing area, and from viewing areas at the Visitor Complex. Launch viewing is included in daily admission. Scheduled to blast off at 5:44 p.m. EST, the rocket will launch from Space Launch Complex 41 at Cape Canaveral Air Force Station United Launch Alliance is launching an Atlas V rocket carrying a classified CLIO satellite for the U.S. Government. Rocket launches capture the viewer's imagination. The last bus taking guests to the Apollo/Saturn V Center for Atlas V launch viewing will depart at 4 p.m. Be sure to check in advance as launch date and time are always subject to change. Located along the Banana River and only three miles from the launch pad, the Apollo/Saturn V viewing area offers the closest public viewing opportunity in Brevard County. This viewing area will feature live launch countdown commentary. Space for launch viewing at the Apollo/Saturn V Center is limited and available on a first come, first served basis. Launch viewing from select areas at the Visitor Complex also will feature live mission control commentary. Plan to spend a day of fun and educational activities including interactive exhibits and 3D IMAX space film at the Visitor Complex, which will be open from 9 a.m. to 6 p.m. on Sept. 16. Admission also includes the U.S. Astronaut Hall of Fame. Admission tickets ($50 for adults and $40 for children ages 3-11) may be purchased at www.KennedySpaceCenter.com or by calling 877-313-2610.